Form component is important piece of portion on any website that require data input from end-user. It could be account creation form, it could be feedback form or it could be any kind of information registration form etc. Since, the data require on forms are input by end-users, therefore, its responsibility of a web engineer to ensure that what kind of information end-user is allowed to register. 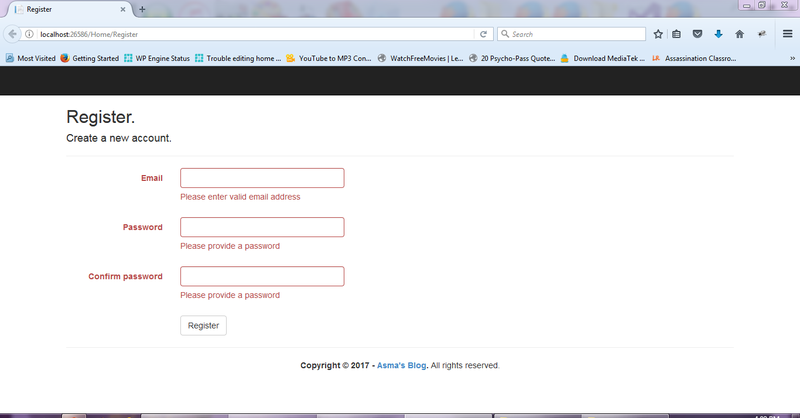 So, here come, web form validation into play. 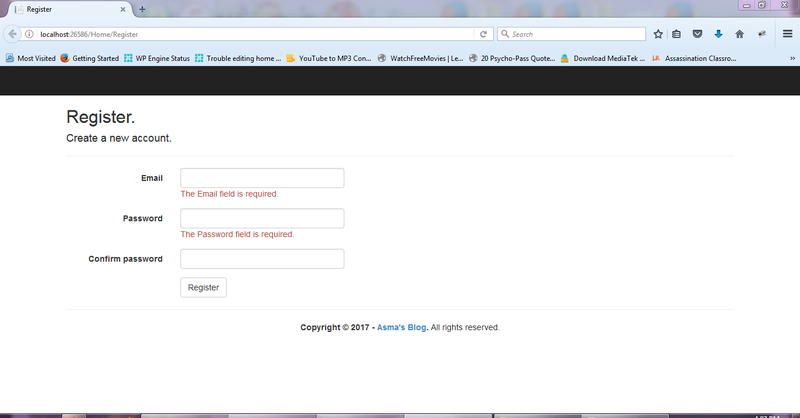 Now, web form validation is of two types i.e. 1) Client Side Form Validation -> This type of form validation is done at browser level meaning handling simple constraint validations e.g. checking empty input fields, identifying valid email address, verification of password constraints etc. Client side form validation also help in providing better user interactivity with the website, while deep verification or validation of input data is being done at server side. 2) Server Side Form Validation -> Server side form validation as the name suggest, is done on server side of the web, which involve deep validation and verification on user input data e.g. identification of valid user account etc. Today, I shall be demonstrating the integration of JQuery base client side validator with ASP.NET MVC5 platform. Although, mvc5 platform already facilitate client side validation as a built-in component. However, the built-in client side validator component is not very user attractive or rich in nature. 1) Create a new MVC web project and name it "JqueryFormValidator". 2) Make sure that you have installed following two Java Scripts into your "Scripts" folder i.e. 3) Now, open "RouteConfig.cs" file and replace following code in it i.e. In the above code, I have simply change my default launch action from "Index" to "Register". 4) Now, open "BundleConfig.cs" file and replace it with following code i.e. In the above code, I have added my "jquery.validate.js", "jquery.validate.unobtrusive.js" & "script-custom-validator.js" scripts as a bundle, which are required for Jquery form validation. Following lines of code are added in above code i.e. 5) Create a new controller class in "Controllers" folder and name it "HomeController.cs". Replace following code in "HomeController.cs" file i.e. In the above code. I have simply created "Register" method both for HTTP Get and HTTP Post method. Both methods are doing nothing just validating my form inputs basic constraints defined in view model. 6) Now, create a new view model class in "Models" folder and name it "HomeViewModels.cs". Replace following piece of code in the "HomeViewModels.cs" file i.e. In the above code I have created my view model for my "Register" UI i.e. "RegisterViewModel" and create three properties in it along with basic validations on those properties e.g. for Email property I have defined required attribute constraint and email constraint. This will help mvc5 platform to identify any invalid basic input from end-user. 7) Now, open "_Layout.cshtml" file from "Shared" folder and replace following code in it i.e. In the above code, I have simply created my basic default layout for all pages. 8) Lets create our "Register.cshtml" view in "Views/Home" folder and place following code in it i.e. In the above code, I have attach my view model "RegisterViewModel" with my "Register" UI. In the above code, notice following line of code i.e. Change above property value to true and execute the project and click "Register" button, without providing any input. You will see following error messages i.e. 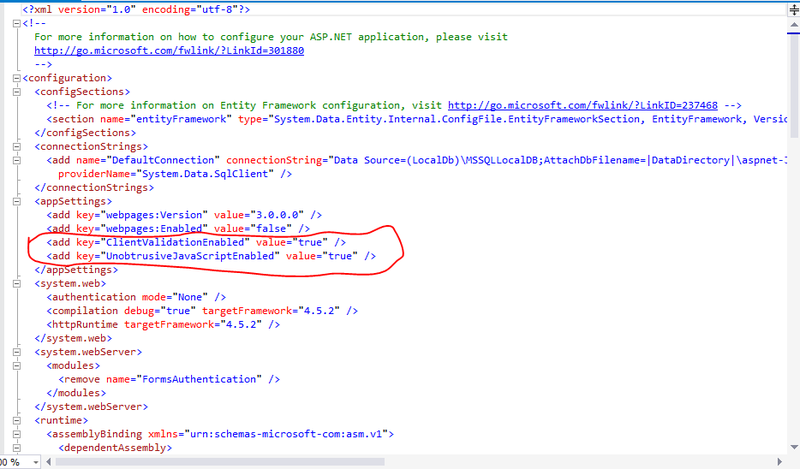 The above images shows default client side validation response of ASP.NET MVC5. Let change that to that of Jquery form validation instead. In the above code, I have defined validation configuration for Jquery form validation lets dissect the code chunk by chunk i.e. 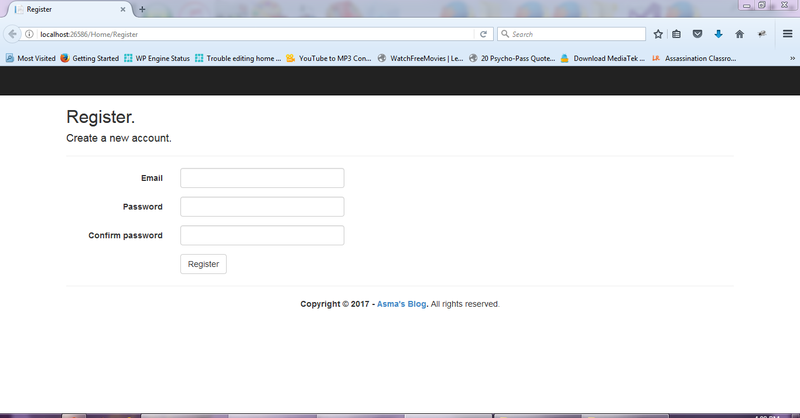 The above piece of code attach my account register form with Jquery form validator by using form ID. Then, I have defined settings about where to place the error message and its related styling. I have also defined methods for validator that what happens when error message is highlighted and form validation is successful. The above piece of code will define our form validation rules and error messages for each input on form. Notice in the above code that in rules & messages section the keyword "Email" actually the "name" property of input tag that our razor view engine automatically generate base on our attach view model. 10) Finally, execute the project and click the "Register" button without providing the input data and you will see the Jquery form validation errors in action as shown i.e. Before I end this tutorial lets talk about following properties in "web.config" file i.e. 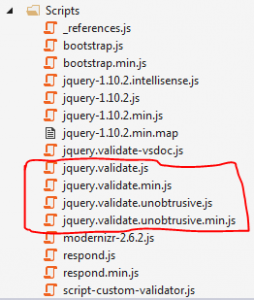 In this article, you will learn about Jquery form validator, how to use Jquery form validator with ASP.NET MVC5, how to configure Jquery form validator, how to stop mvc5 platform client side validation and how to attach Jquery form validator to your form.